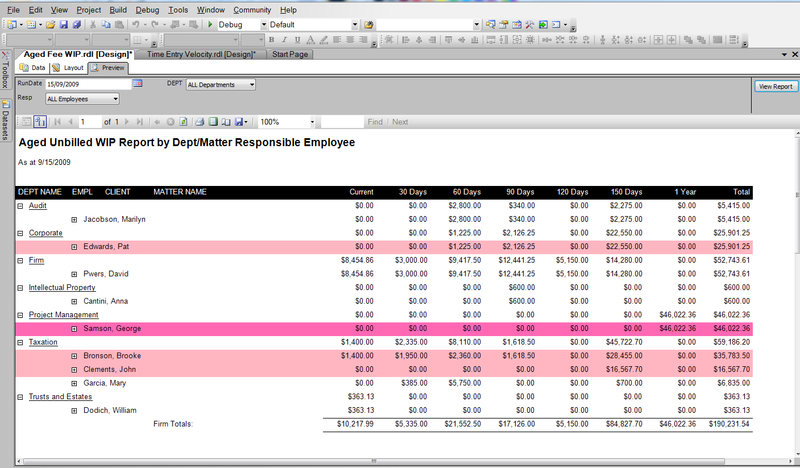 In the Docudraft development world, it makes a lot of sense to modularize your templates. By modularize, I mean: to break out distinct sections (like headers, fee details, timekeeper summaries, disbursement details, etc) into separate documents that get called by a central template. The benefit of this, of course, is that you can easily re-use these sections and create conditional logic inside the principal template to call the sub-templates accordingly. Depending on how many sub-documents are called, how far the conditional logic is extended, and how many different developers have had their fingers in the pot - this can very quickly become a tangled morass for anyone tasked with troubleshooting “the format”. Often when Docudraft error messages appear, a specific reference to a problem variable might be included in the error message. 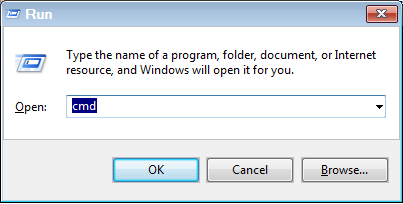 One of the additional challenges support personnel are faced with, is that the Windows Explorer search function isn’t always able to deliver on its promise of being able to pick out specific text (like a problem variable) in documents to help you locate where in the labyrinth of sub-templates the problem might be occurring… so enter the cmd prompt FINDSTR. “xx_my_custom_var” is the string of text you are searching for. Note – don’t include the curly braces. This is important as often variables are used in equations or other logical statements where the curly braces are not apart of the string of text. 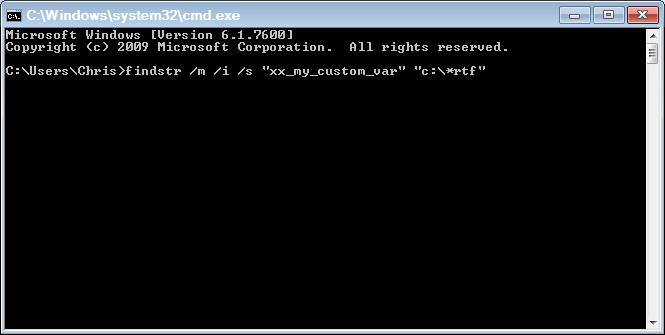 “c:\*rtf” is the location that you want the FINDSTR to search and the types of files to include. In my case I searched the entire C:\ drive (and it’s sub directories). For most Aderant users, however, this will most likely just be the location of your DDTMPLT folder defined in the DDRAFT paths. It is important to note that I also only searched for files of type .RTF (as this isolates only my bill template files). So hopefully that will help you to (more expeditiously) isolate where the problem might exist. A law firm using Aderant Expert asks, “Can we produce a document that looks like our bills through Reporting Services?”. One of the reasons why some may not answer this question with a resounding “absolutely!” relates to how address data is stored in the practice management system (PMS) and how this poses a challenge to presentation and formatting. 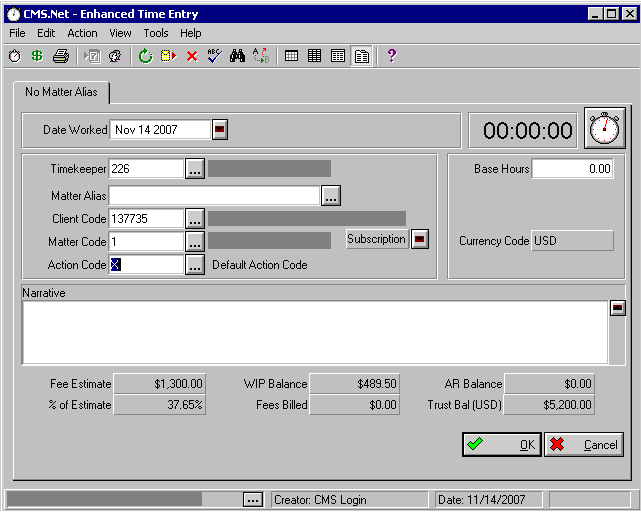 All firms using Aderant Expert should be familiar with Docudraft (DDRAFT) code that allows them to handle permutations in the data, and while some firms may have even written Basicscript code to emulate this logic in Report Writer or End User Painter, firms may only now be looking at Reporting Services to see if the same logic can be applied. 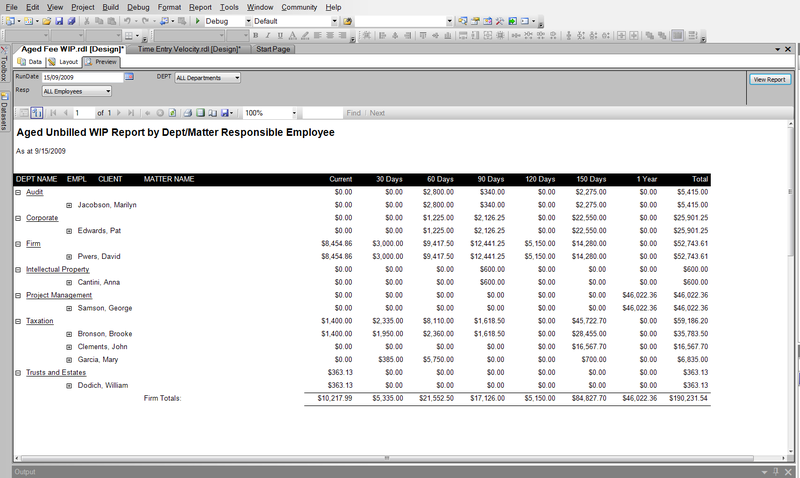 The purpose of this post is to demonstrate how in Reporting Services you might accomplish it. 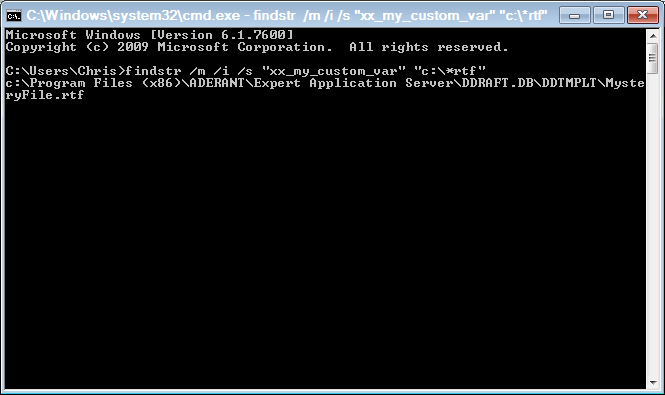 In Aderant Expert, all address data is stored in a table called HBM_ADDRESS. 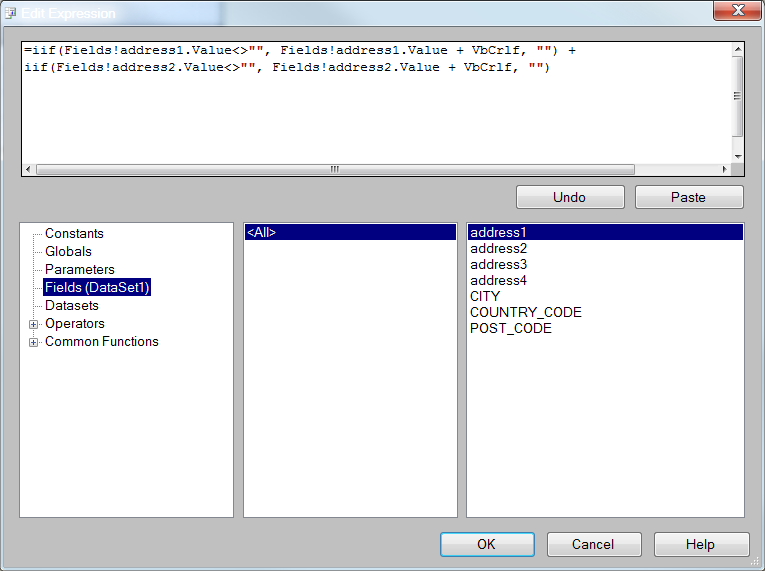 Some examples of the columns in this table are: ADDRESS1, ADDRESS2, ADDRESS3, ADDRESS4, CITY, COUNTRY_CODE, POST_CODE. Depending on the age and origination of the data (i.e. was it converted from a previous system that only stored addresses in text fields? ), and the business rules now enforced at the point of data entry, some database rows may only contain data in the ADDRESS text fields (1, 2, 3, 4), while others have been populated with data in the appropriate placeholder fields (i.e. “Toronto” is populated in the CITY field, instead of ADDRESS3), and some are no doubt a combination of both. Herein lies the challenge: how can I present non-standard data in a standard format? 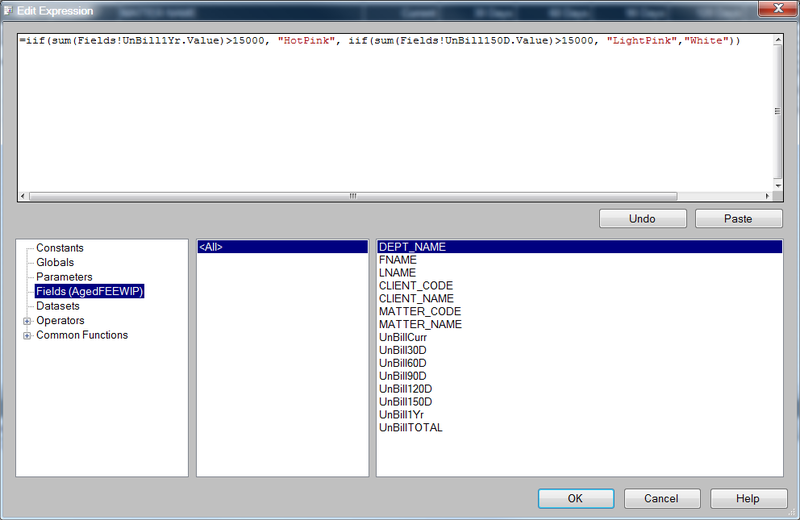 This code instructs the format to only return data if the field in question has a value. If it does, then it will return that value and enter a hard return in order to maintain the format. When a null or a blank is encountered, the entry is skipped, and the next field is evaluated in the same way. Obviously this example is fairly simplistic, but hopefully you can see how you might extrapolate this logic to meet your more complex formatting requirements.